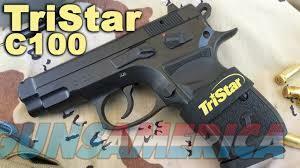 General Description: C-100 comes in 9mm with an aluminum frame and steel slide. Double/Single Action on all calibers. Rear snag-free dovetail sights and fixed blade front sight. All models coated with Cerakote and have black polymer checkered grips. Come with 2 magazines, gunlock, cleaning kit and owner’s manual.